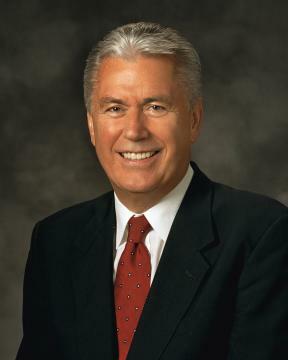 Tweet President Dieter F. Uchtdorf, Second Counselor of The Church of Jesus Christ of Latter-day Saints, gave a talk titled, Forget Me Not, to the Sisters at the September 24, 2011 General Relief Society Meeting. 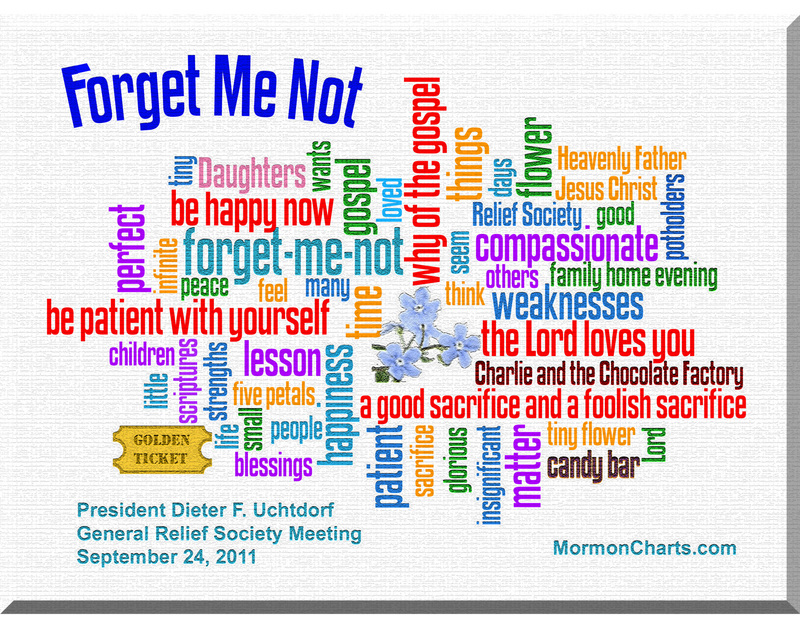 We created a large word art Remembrance Chart from President Uchtdorf’s Forget-Me-Not talk for use as a reminder or a handout. In Forget Me Not, President Uchtdorf, used a tiny flower with five petals, the forget-me-not, at a metaphor for five things it would be wise for the Sisters to never to forget. The difference between a good sacrifice and a foolish sacrifice. The “Why” of the Gospel. President Uchtdorf elaborated on each of the five points (five petals). In “Be Happy Now” he told of the children’s story, Charlie and the Chocolate Factory, when everybody lost sight of the simple joy of chocolate in their quest for a “Golden Ticket”. We used several tools to create what we call a Remembrance Chart of President Uchtdorf’s Forget Me Not talk that can also be used as a handout. We have had numerous requests for the chart in other file formats easier for printing on handouts and other purposes. As a result we have made the chart available below subject to the following Conditions of Use – the file / image is not to be altered. As long as you do not alter it you are welcome to use it for a President Uchtdorf Forget Me Not handout, or anything else EXCEPT selling it, putting it on something for resale, putting it online, or in any negative way against the Church. If you agree to the conditions of use you are welcome to download the files below. You may be able to just right click the links below to download the images. If not, you can left click the links, view them, and save them from there. Forget Me Not Chart high resolution PDF – (about 3.5 MB) If you would like to print the chart as a much larger poster, please contact us (see contact tab at top menu) and we can email you a higher resolution pdf that is too large to post here. Please note, we do sell the Forget Me Not Chart already imprinted on some items below. Although we provide the image for use as described above, several Relief Society presidents have asked us if we could provide imprints on various objects, so we now provide that service via our Mormon Charts store on Zazzle. From our store you can imprint our Forget Me Not design on thousands of objects. A few are shown below. If you would like it on something else, please let me know. Full text of President Uchtdorf’s Forget Me Not presentation is available in the General Relief Society Meeting section of General Conference talks on LDS.org. Although we used wordle, we independently controlled the size, color, and final position of each word or phrase. Colored “Charlie and the Chocolate Factory” and “chocolate bar” in chocolate colors. Put the five main points in red. Created a graphic for the “Golden Ticket”. Processed a forget-me-not flower image as a centerpiece. Accented some words (Heavenly Father, Jesus Christ) in golden colors. Capitalized “Daughters” to help the sisters remember they are Daughters of Heavenly Father. Colored “Daughters” pink in token of the colorful pink robes worn by the sisters in the Mormon Tabernacle Choir at General Conference the next week. We presume that was done as part of Breast Cancer Awareness Month, but have seen no statement to that effect. We gave the chart a bit of of a cross stitch look. We welcome your comments and suggestions. Especially any about how the Remembrance Chart helps you remember President Uchtdorf’s Forget Me Not presentation, how we might improve it, or suggestions of other talks to create charts for. Hi! This is great! We are focusing our stake RS meeting around his talk and this is exactly what I wanted to find to give the Ladies. Do you have it in a downloadable format so I can get it developed? I would appreciate it so much! I’m am wondering the same thing that Gina asked. I would love to print as a 5 x 7 or 8 x 10 to give the ladies I visit teach. Is it possible to print it? We added the Forget Me Not image in some more downloadable formats as links immediately below the image. You are welcome to use them subject to the conditions explained there. We also sell the image on some cards and other objects in our MormonCharts store on Zazzle. Thanks so much to all the hard work and time that went into creating the Forget Me Not Chart. I gave the idea to our Bishop for Mother’s Day, and he loved it. We are framing the chart with frames from the Dollar Tree. You can go online and buy all you need and they are delivered free to your closest Dollar Tree Store! We are printing off President Uchtdorf’s talk on pale blue paper and binding it so it will be a keepsake for them to read often. We are wrapping both with pretty baby blue ribbon and no paper.. We are so exicted to give this to our sisters. Thank you, thank you!